All product reviews will be posted as long as they are written in a clean and proffesional manner. I have just started using my second bottle. I have been making my own yogurt for 40 years. This starter never fails. It is creamy and very thick, I make it once a week, 2 quarts w 1/8 tsp. I keep it in the freezer so it is fresh every time and the date doesnt scare me. It takes a bit of work to get it dissolved. I work on it in a small separate bowl before mixing in the 2qt bowl. Perfect every time. well worth it. I make both 8 hr yogurt and the scd 24 hr for my son. #1 - Ive been using this starter for almost two years and make 4 gallons of yogurt a month for family consumption. It is by far the most consistent starter Ive used and I cant say enough good things about the yogurt it makes. Nice thick structure, great creamy taste, nice zip, but a mild presence thats not overpowering. #2 - It lasts and remains potent for well over a year, so I never worry about it die off in the refrigerator like other starters. #3 - This yogurt has played a large role in taking my digestion from about about a 3 to an 8. I spent years going to doctors, and finally got fed up with the lack of effort and failure to find a solution to my problems. Along with a whole food, animal fat, and "what my great grandmother ate" diet, this yogurt is my breakfast daily. This yogurt will improve your digestive ability and your quality of life. I highly recommend it. I have never tasted yogurt like this. The flavor is very unique. The L. casei has a very interesting flavor and aroma. The yogurt is not tart but is just slightly tangy after 24 hours of fermenting. The yogurt is rather mild. It is quite thick when using whole milk (non-homogenized) and even made the goat milk pretty thick. The price is very reasonable for the amount of starter. The starters with L. acidophilus are quite tangy/tart, so this is a good one for people who prefer a mild yogurt. The yogurt made with the starter tastes delicious and is very thick. I make my cow-milk yogurt in a dehydrator and it is so thick, I can turn the cooled yogurt upside down and it won't run out of the jar. Like it says in the instructions, you should cool the milk down to 80F before adding the starter. This is one key to reliable yogurt time after time. I put my pot of milk in a sink full of water with some ice packs to expedite the cooling. My bottle lasted me about a year(just making yogurt for myself). I noticed a slight change in taste as the bottle neared it's expiration date. When I order again, I will keep it in the freezer instead of the refrigerator. 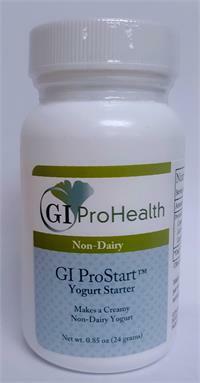 First, thank you GI ProHealth for the prompt delivery of the GI ProStart yogurt starter. It came well protected from heat in the chilled styrofoam clam shell. It makes a deliciously thick, creamy, mild yogurt that isn't nearly as tart as other yogurt starters containing L. Acidophilus. The L. Casei strain is a good one -- well researched and shown to have many beneficial effects. You can't beat the value. Only 1/8th of a teaspoon makes 2 quarts of yogurt. Sprinkling the started over the surface of the warm milk and waiting a bit will help disperse and dissolve it and keep it from gelling together. Haven't attempted any non-cow's milk yogurts yet, but I'm sure my wife (who is sensitive to cow's milk) will have me making some soon. Thanks again! Great product! I use it with nut and seed milks ... almond to hemp to cashew and get great results. I ferment 8-10 hours and this yields a mild yogurt with an ever so slight tang. Thinking I could save a little money I tried using multi-dophilus capsules as a starter and the results were strange and off. I feel better using a mixture of probiotics formulated specifically for yogurt making. One bottle goes a long way. I would suggest using it up within a year (I keep mine in the freezer now). My last bottle slowly "died" and my yogurt was coming out funky and I had to toss a couple batches... I couldn't figure out what it was. Turns out it was just old. I must say the Prostart is the best culture I have used. My daughter, now 14 years old has been free of any Crohns symptoms for 2 years now (using your culture and SCD) I am about to introduce the Prostart and the SCdophilus to another family in the London area. I hope it will turn out to be a life saver for their little girl too.